There were many air raids on Great Britain by Zeppelins and other classes of airship during the Great War. Many aircraft from Home Defence stations operated against these raids. This is just an outline of sorties involving RNAS (later RAF) Bacton. RNAS BACTON was opened as a class 2 night landing ground as a satellite of RNAS Gt. Yarmouth in 1915. It was used, quite extensively, from Sept. 1915 to August 1918 as part of the Home Defence 'system' against raids on Britain by Zeppelins, other airships and fixed wing aircraft. Defence Stations when unable to land at (or find their way back to) their departure airfield. Flying at night when ordered to in all weathers in these aeroplanes, especially getting down again in one piece, was no mean feat. Bacton, Sedgeford, Bircham Newton, Holt, Saxthorpe, West Rudham, Mattishall, Norwich (Aylsham Road and Mousehold), Marham, Gt. Yarmouth, Burgh Castle, Kings Lynn, Thetford, Harling. 8th Sept 20:12 hrs to 22:10hrs. BE2c aircraft No.990 flown by Flt. Sub. Lt. G.W. Hillard. Zeppelin L13 had been sighted coasting in at Wells at 19:35hrs. After patrolling between Cromer and Lowestoft Hilliard misjudged his approach into Bacton the undercarriage collapsed and the 'anti-Zeppelin' bombs he was carrying exploded and Hilliard was killed. 31st January 17:00hrs to 17:50hrs. BE2c aircraft No.1155 flown by Flt Lt. V. Nicholl. Enemy signals which had been intercepted soon after midday warned of a raid. Zeppelins (L13 and L21) were reported just off Cromer. Aircraft got airborne from Yarmouth but visibility was poor and Flt Lt. Nicholl diverted to Bacton. 24th April 23:50hrs to 01:20hrs. BE2c aircraft No. 1166 flown by Flt. Sub. Lt. E. L. Pulling. Pulling was dispatched from Yarmouth. He caught a glimpse of a Zeppelin (L23) 2,000 feet higher but was unable to climb closer to engage it. After losing sight of it he decided to land at Bacton and crashed after hitting telephone wires on the approach to Bacton. His aircraft was badly damaged but Pulling was not seriously injured.22:55hrs to 00:05hrs. BE2c aircraft No. 1194 flown by Flt. Sub. Lt. F.P. Reeves took off from Bacton at 22:55 but no sighting was made and he landed back at Bacton at 00:05hrs. 30th July BE2c aircraft No.8418 flown by Flt. Sub. Lt. E.L. Pulling made 2 sorties from Bacton. 20:05hrs to 21:34hrs and 04:10hrs. to 05:45hrs. According to available German records these sorties would appear to be due to false alarms in the area. 2nd Aug BE2c aircraft No. 8618 flown by Flt. Lt. E. Cadbury (of the chocolate family) flew 2 sorties from Bacton, 20:15hrs to 22:06hrs. and 23:47hrs to 02:10hrs. A force of 5 Zeppelins came in over the East Anglian coast at between Wells and Orfordness. He did not report any sightings. 03:45hrs to 04:10hrs. BE2c aircraft No.1155 flown by Flt. Lt. A.V.Robinson took off from Bacton and returned without making a sighting. 2nd Sept BE2c aircraft No. 8625 flown by Flt Sub. Lt. E.L.Pulling made 3 sorties 00:01hrs to 00:43hrs, 00:58hrs. to 02:10hrs and 02:57hrs to 04:14hrs. The German Navy and Army combined on this night for the biggest airship raid of the war with 16 Zeppelins and airships of various classes targeting London. Pulling failed to make a sighting on any of his 3 sorties. 23rd Sept BE2c No. 8626 21:05hrs to 00:01hrs. flown by Flt. Sub. Lt. E.L. Pulling. A Zeppelin (L30) had been reported off the coast at Cromer but Pulling was unable to locate it. On this night two German Navy 'Super Zeppelins were destroyed. One (L32) was shot down by an RFC BE2c aircraft and the other (L33) was forced down after a sustained attack by a BE2c and damage by anti-aircraft fire. 25th Sept BE2c aircraft No. 8626 Flown by Flt Sub. Lt. E.L. Pulling 20:23hrs to 23:20hrs. 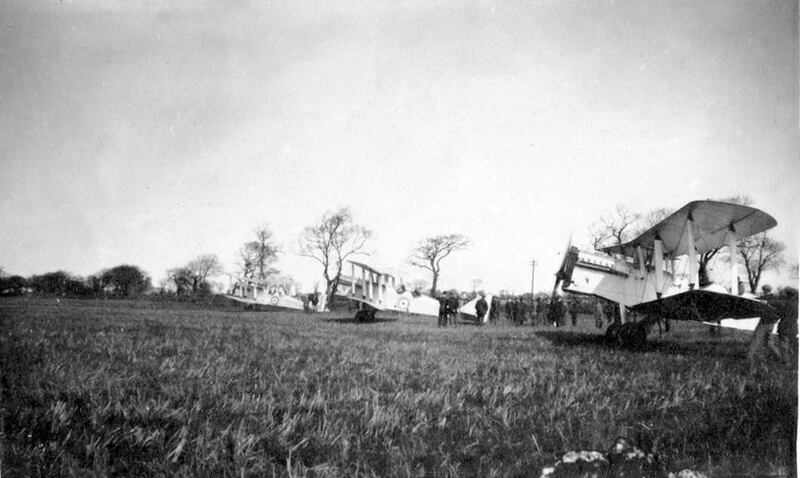 Two of the Zeppelins on this raid ( L14 and L16) crossed the coast near Hornsea at 20:05hr. Pulling failed to make a sighting and returned to Bacton after his patrol. 27th Nov. BE2c aircraft No. 8626 Flown by Flt. Sub. Lt. E.L. Pulling 04:45hrs to 07:15hrs. The combined efforts of Pulling in 8626 and Flt.Lt. Cadbury in BE2c 8625 from Yarmouth destroyed Zeppelin L21 just off the coast near Yarmouth. Pulling received the DSO and Cadbury received the DSC. Pulling had also flown the highest number of anti-Zeppelin patrols by any RNAS or RFC pilot at the time. On 2nd March 1917 Flt Sub-Lt. E.L. Pulling and his passenger Flt Sub-Lt Northrop were killed in BE2c No. 8626 when the aircraft broke up in the air whilst performing a loop. 23rd May BE2c aircraft No.8606 Flown by Flt. Sub-Lt T.G.C. Wood. Three sorties flown from Bacton. 23:45hrs. to 00:58hrs. 02:24hrs to 03:20hrs and 03:30hrs to 05:00. Rain, strong winds and thick cloud hampered operations against several Zeppelins which had been reported off the coast. From German reports the Zeppelins had in fact been wandering around lost above cloud at 16,000 feet. A commander of one of the Zeppelins reported having bombed London, but the bombs had actually fallen in a field in Suffolk. Despite the conditions defending pilots flew many sorties. One pilot, Flt. Sub-Lt H.D. Smith, had taken off from RNAS Holt and failed to return. It is believed that he chased L40 far out to sea and ran out of fuel. He was posted as missing. 24th Sept BE2c aircraft No. 8606 Pilot details not known. Sortie 01:45hrs to 03:56hrs. 19th Oct BE2c aircraft No. 8607 Flown by Flt. Sub-Lt. C.V. Halford-Thompson. Took off from Bacton 21:07hrs diverted to RNAS Holt and crashed whilst landing 22:30hrs. Extent of injuries, if any, not known. RFC and RNAS merge to become RAF on 1st April 1918. 12th April BE2c aircraft No. 9973 Flown by Flt. Sub-Lt F.R. Bicknell. Two sorties 21:20hrs to 22:55hrs and 00:20hrs. to 01:10hrs. 5th Aug DH9 Aircraft No. D5709 Flown by Lt. W.K. Prendergast with 2nd Lt. E Gray as observer/gunner. No further details. On this night Major E. Cadbury and Capt. R. Leckie flying a DH4 from Yarmouth shot down Zeppelin L70 which came down 8 miles out to sea off Wells-next-the-Sea. March 1919 saw the last recorded aircraft movement at Bacton. Article and research by Mike Goodwin. Sources; The Air Defence of Britain, Cole and Cheesman. Gott Strafe England, Nigel Parker. 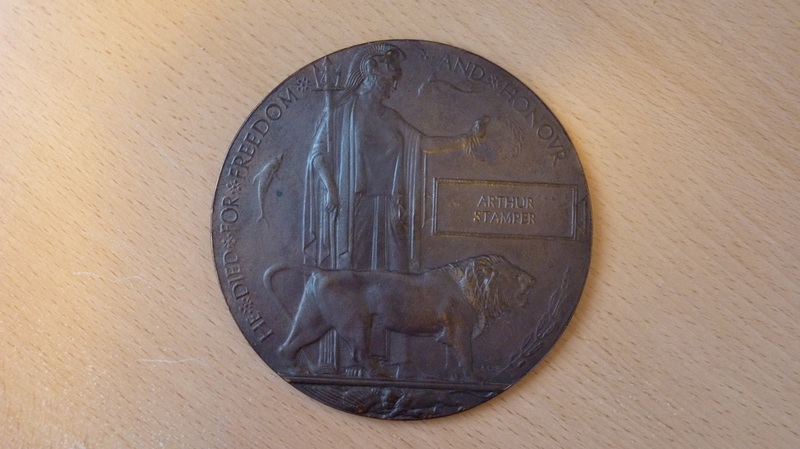 Being interested in 'old stuff', I recently purchased a bronze 'Memorial Plaque', sometimes known as a 'Dead Mans Penny' belonging to the family of Corporal Mechanic, Arthur Stamper No: 313916, from Hammersmith London. These plaques were awarded to the next of kin, of all British service personnel who died during the First World War. Sculptor and medallist Edward Carter Preston designed the plaque, 1,355,000 plaques, about 5 inches in diameter were apparently issued, which used a total of 450 tonnes of bronze, but each was individually cast at either the Memorial Plaque Factory, Acton or the Woolwich Arsenal. The one that I have was cast at Woolwich. The design includes an image of Britannia holding a trident and standing with a lion. The designer's initials, E.CR.P., appear above the front paw. In her left outstretched left hand Britannia holds an oak wreath above the rectangular tablet bearing the deceased's name, cast in raised letters. The names are actually in the casting, rather than being engraved later. The name does not include the rank since there was to be no distinction between sacrifices made by different individuals. Two dolphins swim around Britannia, symbolizing Britain's sea power, and at the bottom a second lion is tearing apart the German eagle. Around the picture the legend reads (in capitals) "He died for freedom and honour", or for the six hundred plaques issued to commemorate women, "She died for freedom and honour". The plaques were issued in a pack with a commemorative scroll from King George V, that I also have, though sometimes the letter and scroll were sent first. Royal Air Force, at the time of his death. The RAF was not formed until April 1st 1918, and Arthur died on 31st October 1918......only 11 days before the armistice on 11 November. 4th Aeroplane Supply Depot Royal Air Force B.E.F. I am writing a few lines to you on behalf of the fellows here who new Arthur Stamper. As one who knew him for some considerable time- we were on No.12 Squadron together- I may say he was regarded as an excellent and very hard worker in our flight. Since our Squadron disbanded and we all joined this depot, he has earned the same opinion from all who were in touch with him. The fellows that were on No.12 Squadron with him will always remember the readiness and willingness which Arthur would do anything he could for them, one thing stands out more prominently was the way he always rolled our tobacco for us, the same as he did for his Father, we could never get the knack of or do this job for ourselves. Some of us who knew him, placed a wreath on his grave and we should very much like you to accept the enclosed as a slight token of the esteem and respect which Arthur was held in by us all. Trusting you are keeping in good health and will accept our best wishes for the future. Whilst researching this I have discovered that 12 Squadron was formed in February 1915 from a flight of No1 squadron, and arrived in France in September at St.Omer, carrying out photo reconnaissance missions. Moving on to bombing railway targets and penetrating as far as Brussels, together with offensive and defensive patrols over the front. In February 1916, 12 Squadron was transferred to VI Corps with whom it served out the remainder of the War. Towards the end of 1916 it was engaged in night bombing with some success. During the German offensive of 1918, the squadron was engaged in contact flying with the troops, resulting in heavy losses. In the summer and autumn allied offensives, they were involved with ammunition dropping, ground attack and air combat. Based at St.Omer, Avesnes-le-Compte, Wagnonlieu, Ablainzevelle, Corcelles-le-Compte, Boiry-St-Martin, Soncamp, Mory and Estourmel, No. 12 Squadron ended the war with 45 enemy aircraft 'kills' to their credit. Although no relation to me at all, I have greatly enjoyed this research into Arthurs history, wondering how this aeroplane mechanic met his fate...... aerial attack or hit by a propeller perhaps, overrun by German offensive ?......... but no, it turns out he died of Pneumonia, possibly as a result of the 'Spanish Flu' ? that was sweeping the world in 1918, and killing up to 100 million people, more than had already been lost in the war. Arthur is buried at Les Baraques Military Cemetery in Sangatte, France, so we made a visit there during our touring holiday last summer.